In recent years, we’ve seen a shift in advertising budgets from traditional methods to digital. 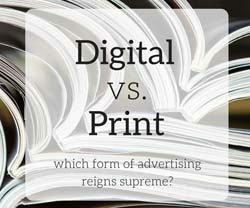 While print remains static, digital is dynamic and engaging. Digital magazines offer a completely different experience for the reader with links, videos, interactivity, animations and more. For publishers it’s a potential goldmine, not only charging for showing an ad but also for the many ways the adverts are shown. The digital publishing industry continues to grow, offering a unique way to advertise. With a digital magazine advert you almost tell a story as the page unravels itself. Compare that to a printed advert where the message must be quite obvious and you are limited for space and creativity. At least with a digital magazine advert you can offer the audience an interactive experience with a hint of exploration. Something exciting that they can navigate through. Within a digital magazine, you can create a content rich advertisement, which is guaranteed to be more appealing than a simple image. As readers, when we browse through a printed magazine or even while watching television, how often do we say to ourselves, I’ll check that out later. With adverts in digital magazines, a simple click can take you directly to the product or service that grabs your attention. Not only that but digital magazine adverts are easier to track and can be filled with videos, photos and many interactive features guaranteed to perform better than traditional adverts. With this in mind, as a publisher you free to charge an increased price for showing ads. We are very much living in a mobile centric world and advertisers must take this into account. A normal print advertisement is typically created to A4 size. When we consider this on a mobile device, the fitting isn’t ideal and the advert can be motionless. The audience has no engagement and are left simply looking at the advert. Compare this to online where the readers will want to engage! Whether it’s to click a button or to view a video, they’d like to do so without the trouble of having to pinch to zoom multiple times or repeatedly clicking on the wrong place leading them to a different link. Creating an advertisement that can be responsive is key, one which adjusts itself to the particular device it’s viewed on. With a digital magazine advert, your only limitations are your creativity. You can create an ad in many formats from a text and image advert to a video, branded content, a game, a feedback form and more. Your options are endless and at 3D Issue we continue adding to this list, giving you new and unique ways to incorporate ads in your digital magazine. We provide you with a range of options for you to choose what works best for you and your magazine. Traditional printed magazine adverts focused on reach. However, when trying to calculate this ‘reach’ there is often a lot of guessing involved and good luck with collecting the hard data. Digital magazines have a significant reach on a worldwide scale and are not restricted by regional boundaries. Readers are engaged as digital magazines offer a range of tools to make your advert interactive. Your readers can remain loyal as their location is irrelevant. Online magazines let publishers drive content to their readers wherever their location may be, proving a faster method. In fact, a large majority of online readers will go through the edition the same day it is circulated. Digital magazines have proven to be an extremely valuable platform for advertising. Ads in digital magazines can be much more engaging than traditional print adverts or even those found on websites. Given the tools available to make the advert interesting like embedded video and animations etc., users tend to ignore them less. When considering digital magazine advertising we must look at young readers. For this younger generation of digital natives, interactive digital magazines are very much an expected media experience. Interactive digital magazines have unique opportunities for reader engagement that are not found in other advertising media. Here at 3D Issue we provide the very best in digital publishing software, allowing publishers to track reader engagement excellently. We provide our clients with all necessary tools to create quality magazines based on the interests of their readers. By keeping readers interested, they are more likely to engage and click on advertisements displayed throughout the publication. In an online digital magazine, you have the ability to make an advertisement fully interactive by adding video, audio, animation, web links and more. 3D Issue offers outstanding advertising features. Have a look at our video tutorials here to see how to utilize these features easily in your own 3D Issue publication.